Intricately linked to the ability of the prefrontal cortex to come fully online are the mitochondria—the powerhouses of your cells and the “feminine life force” referred to by shamans. Mitochondria are the conductors of the genetic orchestra that regulate how every cell ages, divides, and dies. They wave the baton that helps dictate which genes are switched on and which are switched off in every one of our cells, and they provide the fuel for establishing new neural networks. All the mitochondrial DNA in your body is inherited solely from your mother’s lineage, meaning that the source of energy that sustains your life is derived exclusively from the women in your family tree—your matrilineage. Mitochondria were first observed by the German pathologist Richard Altmann in 1890. Seen through a microscope, these small intracellular particles look like tiny, threadlike grains. Hence the name mitochondria, derived from the Greek mitos meaning “thread,” and chondrin, meaning “grain.” It was not until 1949, however, that the role of mitochondria as the producers of cellular energy was fully explained by biological chemistry researchers at the University of Wisconsin-Madison. Mitochondria use carbohydrates as fuel, which they convert into life-sustaining energy with the by-products of water and carbon dioxide. This process is called “oxidative metabolism” because oxygen is consumed in the process, just as oxygen is consumed by fire (as demonstrated when we extinguish a flame by smothering it and depriving it of oxygen). But, unlike in a fire, which releases energy in an uncontrolled reaction, the energy, or life force, produced by mitochondria is stored in a chemical “battery,” a unique molecule called adenosine triphosphate (ATP). Energy-rich ATP can then be transported throughout the cell, releasing energy on demand in the presence of specific enzymes. In addition to the fuel they produce, mitochondria also create a by-product related to oxygen called reactive oxygen species (ROS), also known as free radicals. Mitochondria play a far more interesting role than simply being an energy factory and source of ROS. There are many characteristics of the mitochondria that differentiate them from every other structural part of our cells. For instance, mitochondria possess their own DNA (referred to as mt-DNA), which is distinctly separate from the more familiar and more often studied DNA in the nucleus of the cell (known as n-DNA). While the nucleus of the cell contains two copies of its DNA, mitochondria may have anywhere from two to ten copies of DNA. Interestingly, the mt-DNA, unlike n-DNA, is arranged in a ring, a configuration much like that seen in bacteria. 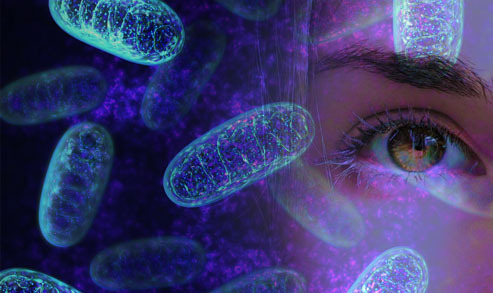 In addition to similarities in the shape of their DNA, mitochondria and bacteria both lack the protein surrounding their genetic code that helps protect it from free radical damage, while in contrast, nuclear DNA is invested with protective proteins called histones, which also serve to regulate its function. These similarities led the biologist Lynn Margulis to propose an important theory of the origin of mitochondria. She posited that mitochondria evolved hundreds of millions of years ago from aerobic (oxygen-breathing) bacteria that gradually entered an “endosymbiotic” relationship with anaerobic bacteria—meaning they began to live inside the bodies of these other organisms. This symbiosis enabled the anaerobic organisms to survive in an oxygen-rich environment. Over time, the mitochondria assumed the primary function of energy production, intracellular signaling, apoptosis regulation, and perhaps communicating with the biosphere. Human mt-DNA contains only 37 genes, while n-DNA has thousands, and it is possible that, over time, n-DNA has been taking on more of the functions of mitochondria, allowing other organelles in the cell to specialize in such activities as protein building, waste elimination, and reproduction. Eventually, one bacterium engulfed another. The result was that these formerly free organisms now reside within each of your cells. Because of their role in energy metabolism, we might expect larger numbers of mitochondria in the cells of tissues to be more metabolically active. And, indeed, individual cells of the brain, skeletal muscle, heart, kidney, and liver may contain thousands of mitochondria, comprising in some cells up to 40 percent of the cellular material. A human adult is believed to possess more than ten million billion mitochondria, making up a full 10 percent of the total body weight. So, while nuclear DNAs main function is to provide the information your cells need to manufacture the various proteins that control the metabolism, repair, and structural integrity of your physical being, it is mitochondrial DNA that directs the production and utilization of your life energy. It determines the fate of every cell, tissue, and organ in your body and the energetic fate of your being as a whole.